We flew to Orlando early on a Tuesday morning, and our Disney’s Magical Express shuttle service ensured we and our luggage were inside of the Disney complex by 11:30 am. There was some system maintenance at our hotel, so we couldn’t check in, so, rather than lose the day waiting for a room in a lobby with a fountain, we decided to use the time to visit Hollywood Studios. 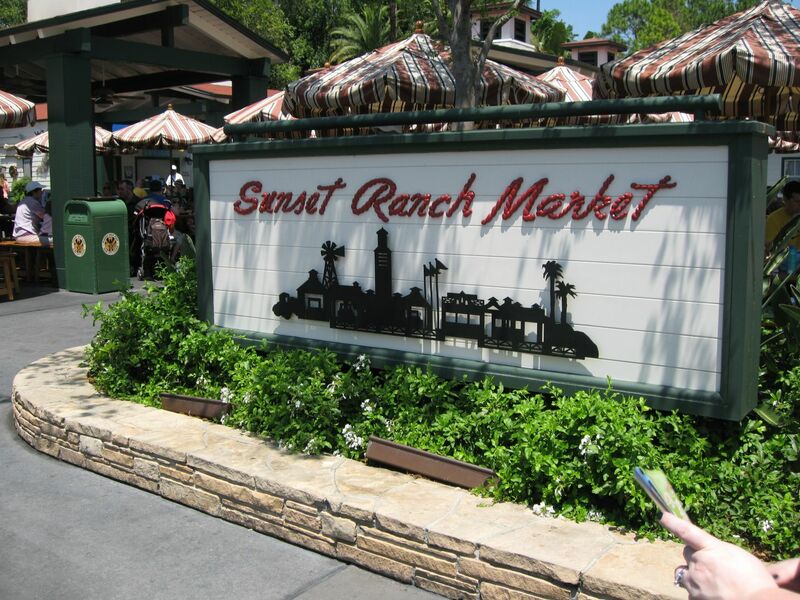 Once we arrived at the park, it seemed like the best thing to do was grab a quick lunch so that we were held over until our 5:30pm dinner reservation at the Hollywood Brown Derby. As we walked through Hollywood Studios, most of the places toward the front of the park were either candy shops or junk food stands (like funnel cakes and popcorn). The first place we came upon for substantial food was Backlot Express which is right within the Sunset Ranch Market. 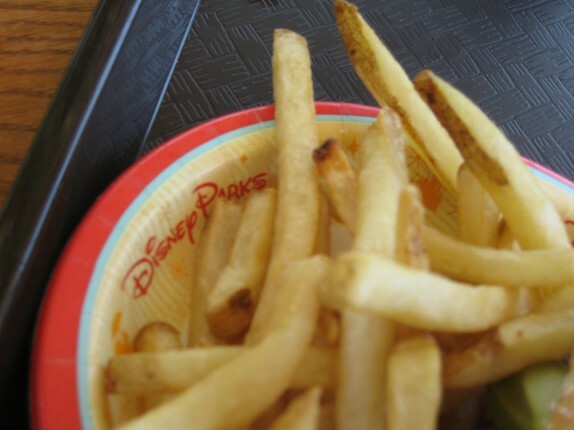 There wasn’t a whole lot on the menu, but this stop worked with the credits we had for the deluxe dining plan. With the plan, you get an appetizer, entree, a drink, and a dessert. 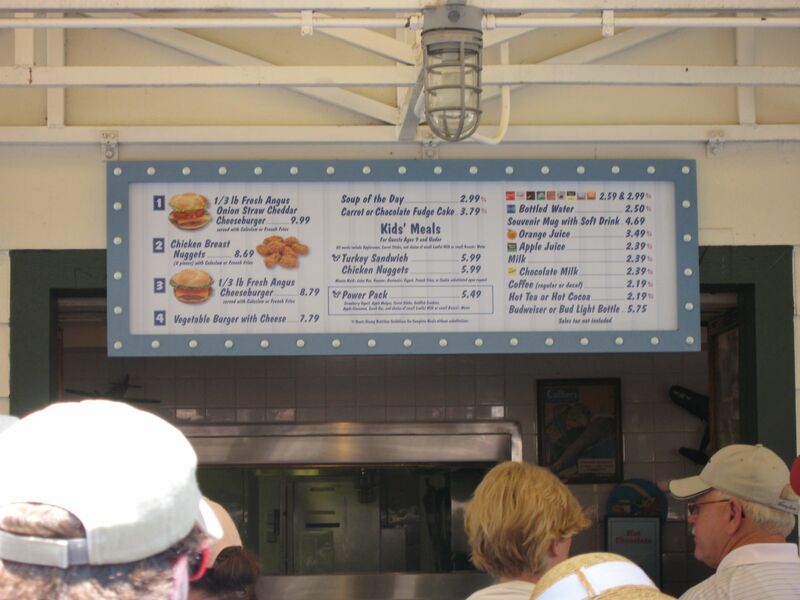 Since we couldn’t check in, we couldn’t use our credits for the dining plan, however. So I paid for the meal and had it refunded once we were able to check in. Cassie and I both ordered burgers. 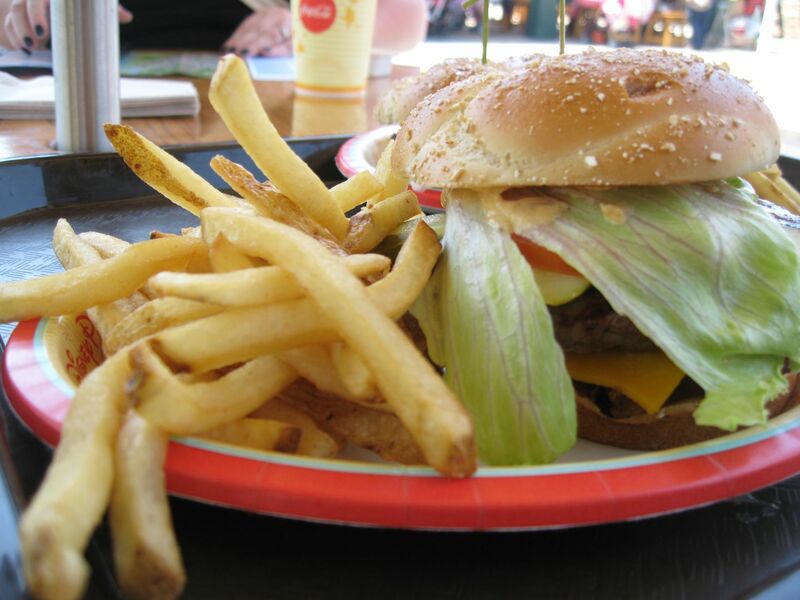 I opted for the burger with onion straws and cheddar cheese. 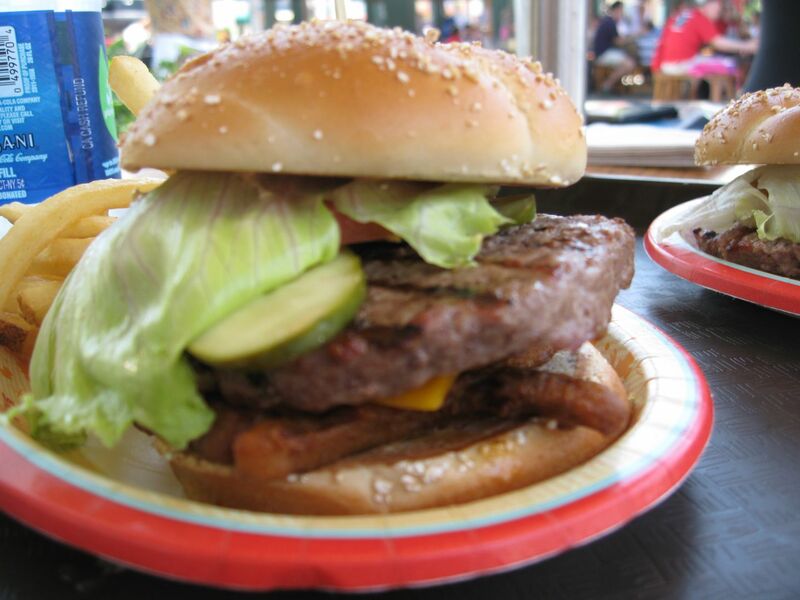 It was a decently cooked, factory-formed burger on a rather good bun with toppings. It was definitely worth the price considering it’s in an amusement park. The fries didn’t get seasoned, so I had to make due with the various dipping sauces that were available at the condiment station. I loaded up on Heinz honey mustard and BBQ sauce for the fries. I skipped dessert for this meal, since I had to shell out the money for this meal and was skeptical that getting it credited would be easy. When we got back to the hotel, management had no problem crediting the meal to my credit card and not deducting from our dining credits, so that actually left us with an extra credit that we used for a premium dining experience later in the trip. 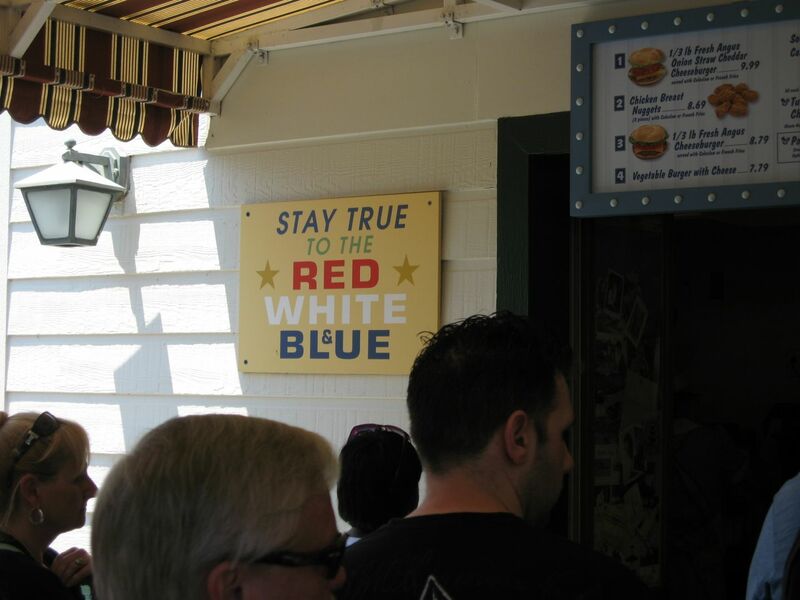 But at least for this meal, just like the sign at the Backlot express said, we stayed true to the red, white, and blue! Yup.. that’s the standard issue. Honestly, there aren’t many places I like to eat at Hollywood Studios. I’ve gotten a chicken sandwich there in a pinch.